We’re doing another round of #VisibleWomen on Monday, February 18th, 2019. Just like last time, we’re accepting submissions of women* colorists, letterers, inkers and writers as well as artists. 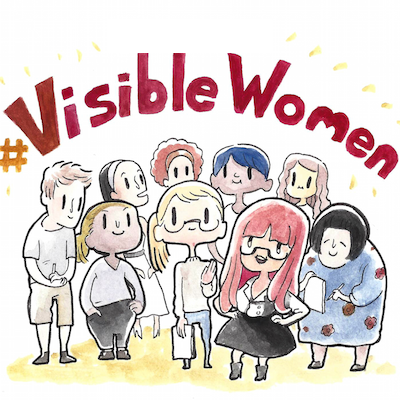 We will signal boost the tweet AND add your info to our #VisibleWomen spreadsheet, which is available free of charge to any hiring professional in the comic book industry. The goals of the initiative are to raise the visibility of women in our industry and to get you work. Here are some templates for tweets that will be easy for us to put in our spreadsheet. 280 characters is not a lot, so if you can include a word or two about your style, GREAT! If not, give us enough to get us started. Additionally, to ease sorting/searching, please write your discipline (I DRAW/LETTER/COLOR/INK/WRITE) in ALL CAPS in your post. IMPORTANT: SELF SUBMISSIONS ONLY. It’s GREAT that you want to support your friends, but do not submit for them. We don’t want to risk signal-boosting someone who does not yet feel ready. Cool? Cool. Join us on Twitter on February 18th. * #VisibleWomen is intended to raise the profiles of women** comic creators, but we also welcome (and have always welcomed) non-binary creators too. If you identify as “not male” and would like to participate, please do! ** Because we’ve gotten the question every time we’ve done this, yes, trans women are welcome. Trans women are women. We also welcome short women and tall women. We don’t want to add to anyone’s anxiety around gender identity. No one is going to ask for papers – if you know yourself to be a woman (or not a man), and could use a signal boost, please join us!